"Let's Play Gaming Expo (July 28-29): Two-Player Demos"
Every year we have our two-player setup with Hyper Fighting modded out to a projector so you can watch people play. This year, we're going to be showcasing not only HF, but Mario Tennis, TicTacToe, and 3D Battlesnake!!! If you're in the North Texas area, I highly recommend coming out. We'd do more setups, but I kept getting out bid all year on new units. Awesome! I love the "official" game link graphic. If Nintendo isn't going to make one, then ours is as official as it gets! 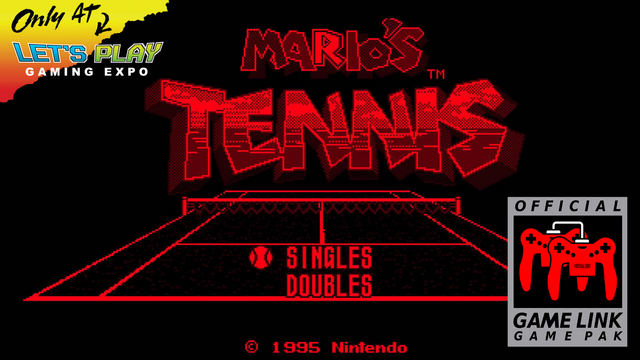 That was designed by STEREO BOY I think in the Mario Tennis thread. I think he has some updated designs, but this is the one I thought popped nicely. I asked if it was okay to use it, spk. If you could bring a setup by the Irving Convention Center Thurs/Fri of next week, I think we have a third VB, which would mean two, 2-Player setups. There is a chance we'll actually have four sets of 2-Player games for the VB and we'll swap them in/out over the course of the weekend. Will confirm when items are in hand! Every year we have our two-player setup with Hyper Fighting modded out to a projector so you can watch people play.